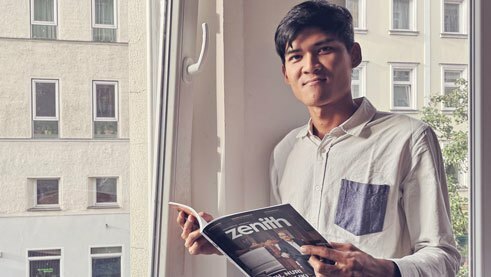 Cultural journalist Mratt Kyaw Thu swapped his workplace in Yangon for one in Berlin. During his three-week stay as part of the Goethe-Institut’s Close-Up project, he is a guest of the Berlin-based magazine zenith and is reporting on his experiences in the German capital. I always get that answer when I greet people in Germany. Since I’ve never been to Europe before, I didn’t know anything about the Germans and their behaviour either. However, what struck me after just a short time is that the Germans are very serious. I wonder if they ever laugh. Every morning I go to a bakery on the corner of Stahlheimer Strasse and Erich-Weinert-Strasse, where I’ll be living for a month thanks to the support of the Goethe-Institut. When I meet strangers on my way, I smile at them if our eyes meet. But they always look at me oddly. People are always in a hurry and always seem to be thinking about something serious. The weather in Berlin is very nice right now, so there’s no reason to be so serious. But that’s probably the big difference between Europeans and Asians. Since I have a roommate in Berlin, I hoped to make more friends during my stay in the city. I really tried hard to make friends but was unsuccessful for a whole week. Fortunately, at an event where some Asians and Europeans came together I was greeted by a young woman when she realized that I’m from Myanmar. Then she invited me to a party. There, at last, I got an answer to the question that had been puzzling me all along: Why is friendship so burdensome for the people of Berlin? A young man explained it in simple terms. “You have to invest a lot in friendships. You need to build trust, be caring and friendly, and contribute much more that’s needed for a friendship.” On the way home, I wondered whether I would really call the people I met at the party “friends” or whether I would have to invest more. I usually hate loud, overcrowded cities. One of my colleagues warned me on the first day to be careful here while cycling because everything is so crowded. A week later, however, I found that “crowded” in Berlin means 80 percent less “crowded” than in Yangon. Hermannplatz, Alexanderplatz and Checkpoint Charlie are the most crowded places I’ve experienced in Berlin, although they are still very suitable for cycling. One of the reasons I love Berlin so much is its bicycle culture. As in other European cities, the cycling paths, which don’t exist my country, are among the best inventions. It’s also simply a unique experience to cycle past the centuries-old buildings, many churches and cathedrals. After a week in the city, I discovered that Berliners are made up of a mix of conservative thinking and neo-modern lifestyle. There’s one particular day in Berlin that I will never forget. It was the day employees of the Berlin public transport checked my ticket in the tram. Since I didn’t know that tickets expire after two hours, I used them outside of this timeframe. Eventually, I was caught by BVG inspectors along with a rapper-like American and a Portuguese girl. “I’m American. Call the police!” the rapper shouted to a BVG inspector while the others were busy with me and the Portuguese girl. Then the rapper asked how long this would take, and the controller replied, “Maybe two hours.” The American replied that was impossible, he couldn’t wait that long and simply walked away. The Portuguese girl and I were inspected without comment. Then I went with her to the BVG counter to pay the fine. On the way to my flat, I received an incredible gift – my first ever in Berlin. I asked a passer-by if he could help me with the ticket purchase, because the machine wouldn’t accept my two euro coin. He simply ignored me. Then a girl appeared and helped me buy a ticket. Then she smiled at me very kindly and wished me a good journey.